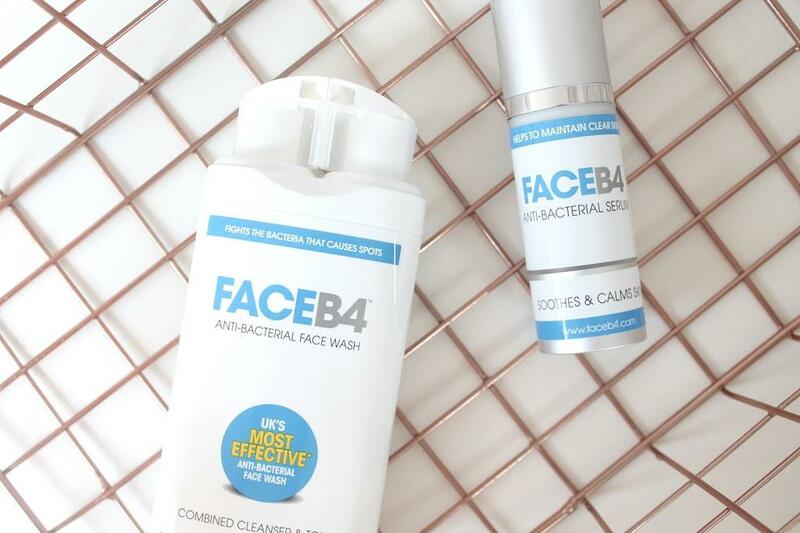 I have been trying out these products over the past month and thought it was time to share with you my thoughts on this antibacterial skincare regime from Face B4. I received the antibacterial face wash (£14.95)* and the antibacterial serum (£14.95)*. These products are available from boots and faceb4.com. I have a few scars from previous breakouts and my chin area has always been prone to hyper pigmentation and scaring, I have tried a few different products in the past so I was open minded to try something new because as of yet I haven’t found a product that has helped maintain clearer skin. The antibacterial face wash claims to “fight the bacteria that causes spots”. It can be used on all skin types and it “helps to give you the spot-free skin you had B4”. 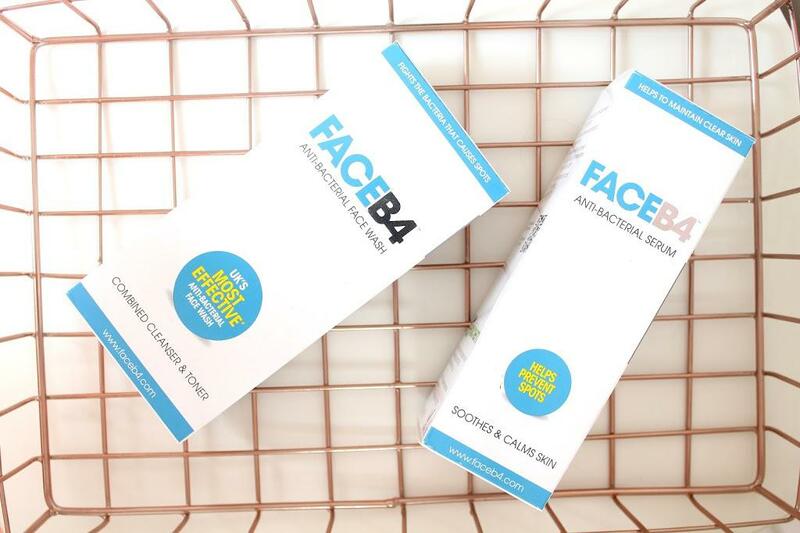 The face wash itself is a combined cleanser and toner in one, once squirted out, both products mix together to create a foam. On the back of the packaging it tells you to apply the face wash onto wet skin and gently massage with circular movements. Then rinse with warm water. I have been using this face wash everyday for the past month and I have started to see noticeable changes in the appearance of my skin. I tend to use this face wash more in the mornings than at night because I find that it is better at cleansing my skin and waking it up rather than removing my makeup at night. When I first used this face wash I wasn’t too keen on it, I was using it to take off my makeup whereas now I only use it on clean skin in the mornings and it works a lot better. This face wash is enriched with vitamins A, B, B5 and E to moisturise, soothe and calm the skin. It is defiantly moisturising and calming on the skin. I have been enjoying this face wash as part of my morning routine. The antibacterial serum however is what stole the show for me, I have been using this twice a day (morning and night) and I have been loving the results. It claims to do the same things as the face wash, to sooth and calm the skin and is suitable for all skin types. “Helps to maintain clear skin”. You only need a small amount of the serum to cover the whole face, avoiding the eye area. A little product goes a long way and it skins into the skin quickly and effectively. I use the serum in the mornings after I have washed my face using the face wash and before my morning moisturiser. I also use this at night time after I have cleansed my skin and before my night time moisturiser. The packaging of both products are simple, they tell you exactly what to do on the back, what the product aims to do and what the targeted areas are. The packaging for the face wash I find a little too big and chunky. It is fine for at home but I would struggle to travel with the product because of the size of it, however do take into account that it is a cleanser and toner in one, so if your used to carrying around two big bottles this could save you some space. The serum however is great for travel, its slim and tall and not too chunky. I took this on my recent trip to London for the weekend and it is now a product I can’t see myself without. My overall thoughts on these antibacterial skincare products are great, I can see myself re-purchasing these products because I have started to see clearer results. Have you ever tried these products before? Do you want to?